When I still saw him roaming a couple of days later, I picked up him up and immediately started looking for his owners. I posted flyers all over my neighborhood -- my flyers had larger letters than all the other flyers posted; I posted a found ad in the local paper; and I advertised him on several Internet sites. I also walked him all over the neighborhood 4 times a day. Several neighbors who saw me walking him told me that they had seen the dog roaming for at least a week. One person said two weeks. After 3 days, I started falling for the little guy and I dread hearing my phone ring. I was ready to return him to his original family, but I began hoping that no one was looking for him. After 5 days, I removed all of my signs and took down my Internet postings. On the 10th day, the family was out and about looking for him ( saw them reading flyers) and saw us together in my front yard. The family lived in the same neighborhood. I asked the Mom why she didn't post any lost flyers. She said "I called the pound." I ask her if she had seen any of the flyers I posted. She said "You didn't post any by my house." (I did). I asked if she saw my ad in the paper. She said, "I don't get the paper." I asked her for medical records and she had them. I also went and spoke to the receptionist at his vet's office. She told me that Carlos had been seen regularly for allergy issues. The family was definitely irresponsible, but did they deserve to loose their dog? I strongly considered not giving the dog back, but this dog was 8 years old and had lived with this family all of his life. 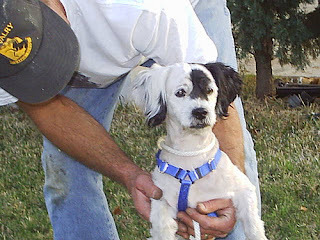 The dog was in good shape physically, was well groomed, and was under a vet's care. The deciding factor me was the lady's two well behaved little boys. They had known this dog all of their lives and it wasn't their fault that their Mom wasn't more careful. It was a gut wrenching thing for me to do, but I gave him back. I never saw the dog loose again so hopefully this person learned her lesson. It all worked out for the best. A few months later, Lupe came along. 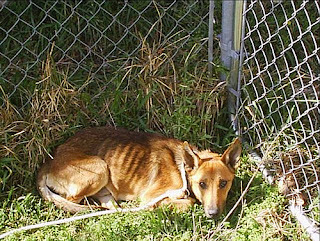 She was starving and terrified and didn't have a home. She needed me a lot more than "Carlos" did. BTW, Carlos is what I called him. His given name was "Doggie Doggie"
That is a touching story and what a cute dog. I just found a dog and also hope no one calls. My current dog has become jealous and protective of me - he sometimes growls if the new dog gets too close and all the new guy wants to do is play or get petted. What do you recommend for this? Thanks for the saving the dog. What your current dog is doing is understandable and it's probably "resource guarding"
Normally when adding a new dog to the family, it's best to take it slowy. i.e. short meetings in neutral territory. But sometimes that's not always feasible. When it's not, we do what we can to keep the peace while we work on letting the dogs get acclimated to each other. That might mean not petting the new dog when the old dog is watching.